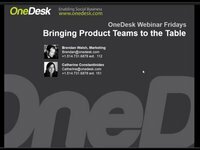 OneDesk can dramatically simplify the product planning and execution process. This Friday, join us as we unveil a new series: Turning Customer Feedback Intro Product Gold. You can register for this Webinar here.